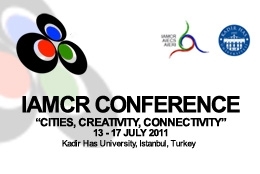 IAMCR conference hosted by Kadir Has University , will be held in Istanbul, Turkey, July 13-17, under the theme Cities, Creativity, Connectivity. The conference will be attended by close to 1000 registered academics and researchers, participating in some 340 concurrent panel sessions and 24 poster sessions. While the majority of attendees will be established scholars from Europe and North America, Istanbul will also see participation from a strong contingent of experienced scholars from the developing countries and a large number of emerging scholars, young researchers and students from all continents. Visit the conference website to download the program.